The best selling car in the United States isn't an Impala or a Jetta, it's the Cozy Coupe, the outdoor kids double plastic car toy that topped the Toyota Camry and Honda Accord in sales in 2008. Plastic cars that children can "drive" outdoors have long been popular in America (the Cozy Coupe has sold over 10 million units in its thirty year history), and continue to be so today. Not only are the toys fun-after all, they can provide hours of driveway entertainment-they are educational as responsible parents teach their children the rules of safe and responsible driving habits. Plastic toy cars are durable, inexpensive, and very rewarding for children. Here's a guide to some of the most popular models. Cozy Coupe - One of the most popular cars for children on the market, the Cozy Coupe is a no-frills plastic toy car powered by the feet of your child. No batteries or pedals are required to make this vehicle an entertaining learning experience for young boys and girls. While the classic orange and yellow Cozy Coupes are still available (and are an attractive option for parents who want to make sure their child is highly visible to avoid collisions with bikers and pedestrians), other models have popped up in recent years that allow children options and versatility for their "first car". Check out the Tykes Patrol and the Princess Coupe for colors and designs that your child will love. Power Wheels - For decades, the Power Wheels line of outdoor kids double plastic car toys have dominated the battery-powered toy car market. With seats that can easily accommodate two children, Power Wheels are the go-to option for families on a limited budget with more than one child. These vehicles are available in a wide range of options. Classic cars and modern muscle vehicles are represented, as are SUVs, coupes, convertibles, and four-wheelers or monster trucks. The realistic controls and actual working engines provide a learning experience for children whose parents want to teach the "rules of the road" at an early age. Power Wheels also carry a one-year warranty. Cars for Children - Allow your child to live in the lap of luxury with the models of expensive sports cars offered by Cars for Children. Similar to Power Wheels in function, these plastic outdoor cars are available in choice offerings such as Corvette, Testarossa, and Mercedes. The product line offered by Cars for Children covers many luxury vehicles and, like Power Wheels vehicles, comes with an unlimited one-year warranty. 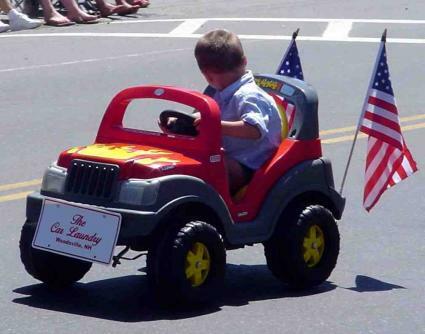 Allow your child to dominate the driveway in style with a vehicle from Cars for Children. Kids Wheels - In a formula similar to Riding Toys for Kids, Kids Wheels provides both battery-powered toy automobiles and some very creative pedal-driven vehicles for all children. This company makes realistic passenger cars and Jeeps as well as four-wheelers just like dad rides! However, their creative pedal cars-not quite a scooter or a luge, but the low-rider EzyRoller-will give your kids exercise on a machine very different from the bikes most of the children in the neighborhood ride. Kids Wheels also offers a variety of materials to help you keep your child's ride in top shape in case it breaks down after long hours on the road. Whichever model you choose, outdoor plastic toys are sure to help your child enjoy an easy ride on the path to imagination.